A small yellow plane with a high-temperature engine condition used an Interstate 35 on-ramp in Chisago County as a landing strip Saturday. 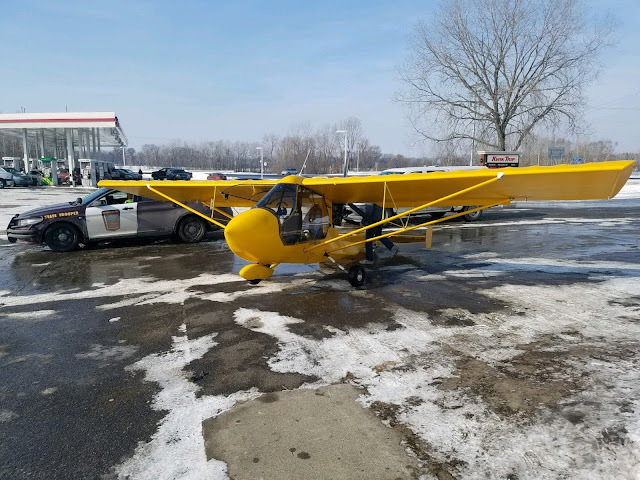 The Chisago County sheriff’s office tweeted out a photo of the plane, saying the pilot then taxied to a nearby Kwik Trip gas station in Stacy. The pilot, Michael Robbins, 47, of Cambridge left the Cambridge Municipal Airport that morning and flew to New Richmond Regional Airport in Wisconsin. From there, he landed on Green Lake in Chisago Lakes Township to visit some friends who were going to be ice fishing, said Sgt. Steve Pouti of the Chisago County sheriff’s office. Robbins had noticed that his plane’s engine temperature was running high, so after leaving the lake, he headed back toward Cambridge, but only made it as far as Stacy before the plane’s temperature became critical, Pouti said. He circled, looking for a place to land, and chose the interstate on-ramp. From there, he taxied to the gas station on Stacy Trail. Police received a call at 11:19 a.m. that a plane had landed on the highway. The sheriff’s deputies assisted the Minnesota State Patrol and waited with Robbins while he fixed his plane in the Kwik Trip parking lot. About 4:15 p.m., Robbins had the plane fixed. The police blocked off the road so he could get airborne. Pouti confirmed that Robbins made it safely back to his hangar in Cambridge. STACY, Minn. (FOX 9) - A small, yellow plane made an emergency landing on an I-35 exit ramp in Stacy, Minnesota after 11 a.m. Saturday. According to the Chisago County Sheriff’s Office, the aircraft engine was overheating and had to make an emergency landing. 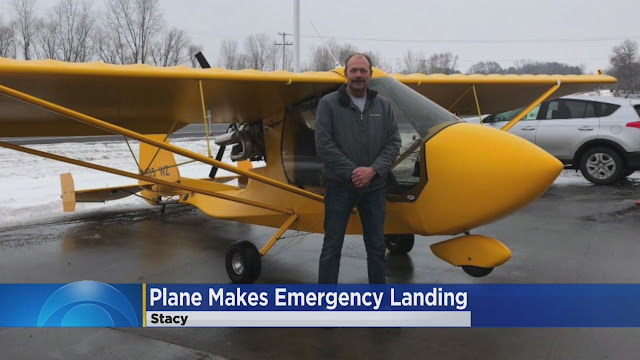 The pilot, Michael Robbins, of Green Lake, Minn., saw on his temperature gauge that his plane was at an unsafe temperature to continue to fly and determined he needed to land quickly, according to Sgt. Steve Pouti of the Chisago County Sheriff's Office. Robbins decided to use the exit ramp to land and then he taxied the plane to a Kwik Trip parking lot in the area. Later, the pilot determined the issue was due to a coolant leak, which he has since fixed. The Sheriff’s Office said there were no injuries or damage as a result of the emergency landing. The FAA was notified of the incident, but does not need to get involved because no injuries or damage to property occurred. The landing is not classified as a crash. According to the Chisago County Sheriff’s Office, the fixed-wing single-engine experimental plane was forced to make an emergency landing when it “engine overheated.” The pilot brought it down on the exit ramp and taxied to the parking lot of a nearby Kwik Trip at about 9:30 a.m. According to online records, the plane is co-owned by Michael L. Robbins of Cambridge, Minnesota. January 02, 2017: Aircraft landed on road due to engine problems.